By Modelflyers (MFS), November 11, 2017 in How Do I...? I'm sure I've seen somebody do it before but I just can't remember where. I love my Oregon but I do have one major problem with the default symbols that get used, especially the unknown question mark symbol which just disappears into the background. I have got as far as creating and loading a custom bitmap onto the Oregon but I cannot work out how to get the GPX file to refer to the new symbol. Any helpful suggestions would be much appreciated. 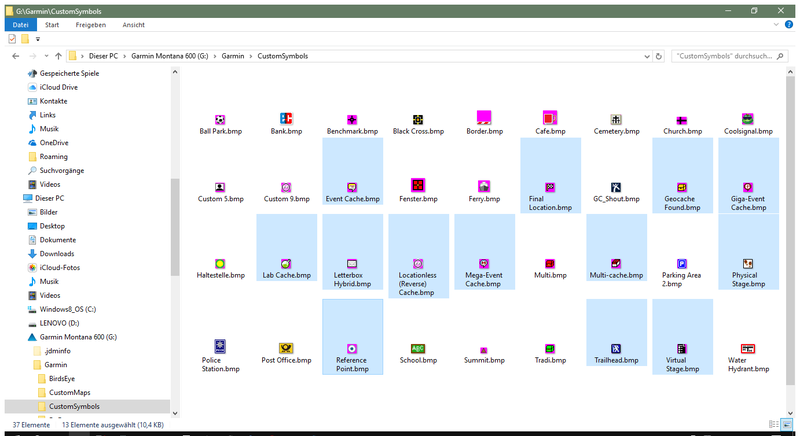 Do you created the icon with the Garmin specific rules? The unit's firmware itself is automatically mapping the new icon against the old one. You have to name the new icon in exactly the same way than the built-in icons are named. The firmware matches the GPXses <sym> and the <type> tag for replacing the icons. Using Custom Symbols is also doable with additional waypoints. Additional waypoints with their dedicated icon are much more useful than the default blue flags. Thanks Hans, I can certainly see my new marker in the custom markers on my list, but the filename is the random name I gave it, I'll try the naming thing. You'll find Custom Symbols for Additional Waypoints there. Just tried it with my test bitmap and it works perfectly.